Susan Nance was a loving Wife and Sister and Friend. 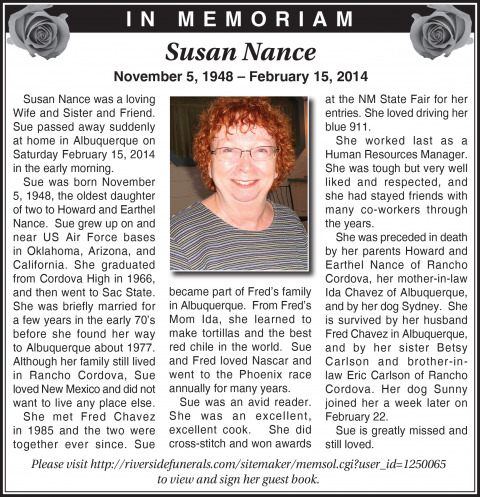 Sue passed away suddenly at home in Albuquerque on Saturday February 15, 2014 in the early morning. Sue was born November 5, 1948, the oldest daughter of two to Howard and Earthel Nance. Sue grew up on and near US Air Force bases in Oklahoma, Arizona, and California. She graduated from Cordova High in 1966, and then went to Sac State. She was briefly married for a few years in the early 70’s before she found her way to Albuquerque about 1977. Although her family still lived in Rancho Cordova, Sue loved New Mexico and did not want to live any place else. She met Fred Chavez in 1985 and the two were together ever since. Sue became part of Fred’s family in Albuquerque. From Fred’s Mom Ida, she learned to make tortillas and the best red chile in the world. Sue and Fred loved Nascar and went to the Phoenix race annually for many years. Sue was an avid reader. She was an excellent, excellent cook. She did cross-stitch and won awards at the NM State Fair for her entries. She loved driving her blue 911. She worked last as a Human Resources Manager. She was tough but very well liked and respected, and she had stayed friends with many co-workers through the years. She was preceded in death by her parents Howard and Earthel Nance of Rancho Cordova, her mother-in-law Ida Chavez of Albuquerque, and by her dog Sydney. She is survived by her husband Fred Chavez in Albuquerque, and by her sister Betsy Carlson and brother-in-law Eric Carlson of Rancho Cordova. Her dog Sunny joined her a week later on February 22. Sue is greatly missed and still loved. Please visit http://riversidefunerals.com/sitemaker/memsol.cgi?user_id=1250065 to view and sign her guest book.